Secret time: I’m afraid of knitting cables. I realize this is an irrational fear, because what’s so scary about cables, anyway? Literally…nothing. I think my lack of practice has led me to believe they are just too complicated and I’ll inevitably mess up the pattern somehow. This is one reason why I wanted to explore cables in knitscene Fall 2018. I wanted to see some nontraditional type cables that were intriguing and yet not overwhelming. The Olivia Sweater is a perfect example of interesting, beautiful cables made easy! The Olivia Sweater makes a bold statement by intertwining multiple parallel cables. This pullover is worked in the round from the top down with yoke shaping. The sleeves are worked in the round from the top down. 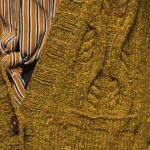 The cable pattern that runs down the middle of the front of the sweater is not difficult to knit, but the relief it creates really makes an impression. The cushy Sugar Bush Canoe yarn makes the sweater plush, thick, and super warm as well! 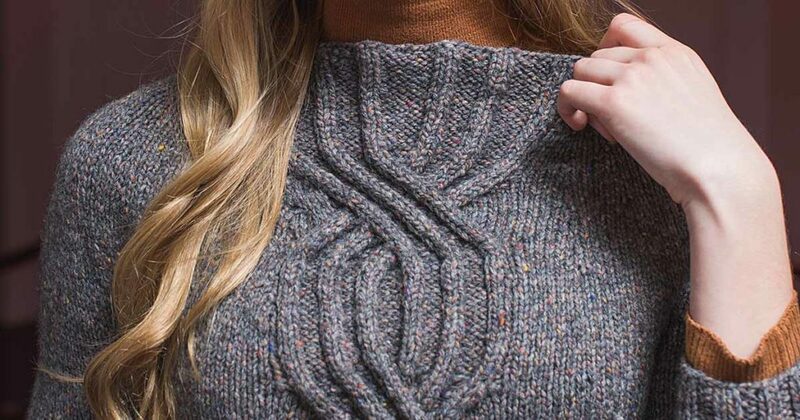 If you’re like me and don’t often veer into the world of cable knitting, the Olivia Sweater (or any one of the seven other cabled sweaters in this issue) is a great candidate for some simple cable practice. So, get cabling with the Olivia Sweater! YARN Sugar Bush Yarns Canoe (61% wool, 26% alpaca, 13% nylon; 95 yd [87 m]/1¾ oz [50 g]): #7003 dusk, 8 (9, 10, 12, 13, 14) balls. NEEDLES Size 8 (5 mm): 16″ and 24″ circular (cir) and set of double-pointed (dpn). Adjust needle size if necessary to obtain the correct gauge. GAUGE 17 sts and 27 rnds = 4″ in St st; 36-st cable = 5″ wide. Cast on the Olivia Sweater now!